Although cyclists have to overcome the forces of gravity and the rolling resistance of tyres on roads/moving components on the bike, once your speed exceeds around 15mph, it's aerodynamic drag that becomes your main enemy. Drag is a frictional force caused by the turbulence of displacing air that is pushed out of the way as you pass through it. Pedalling along at 20mph requires the displacement of no less than 1000lbs of air per minute1! Aerodynamic drag increases as the square of velocity; if you double your speed, you will expend 4 times the energy to overcome drag. Expressed another way, for every increment of extra power you apply at the pedals, your increase in speed becomes progressively smaller. Eg, it requires 7.2 watts of power per mph to sustain 19mph on the flat; to sustain 30mph requires no less than 13.1 watts per mph! Because energy-sapping aerodynamic drag is always present when cycling, learning how to minimise drag is vital for riding fast. Studies show that around one third of drag is caused by the bike, and two thirds by the rider, so reducing rider drag is the number one priority2. And the best way to achieve this is to hone the riding position so that maximum power can be achieved with minimum drag. • Tuck down on drop handlebars and adopt a 3 & 6 o'clock position with the feet on the pedals during long descents. However, while the most aerodynamic position is rarely going to be the most comfortable, you should ensure that you're still comfy enough to produce near maximum power, because it's power that you need to overcome drag! It's not just riding position that affects drag, but the tactics you use when you ride. Studies have demonstrated that if you can tuck in behind another rider and stay around 30cms from the back wheel, drag is reduced by around a fifth at 20mph3. The faster your riding speed, the greater the potential energy savings to be made. This explains why stage race riders only appear at the front of the pack at the end of stage; they shield themselves using other riders until their sprinting or climbing legs are needed. • Helmets – can also make significant contributions to drag reduction. We recently conducted tests with industry experts and discovered that an aerodynamic helmet produced significant reductions in drag compared to a normal vented helmet. Our data revealed that at a power of 300 watts, a rider using an aero-helmet could travel over a mile further during an hour's pedalling or, expressed another way, could chop around 2 minutes off a 25-mile time trial! • Clothing – can make a big difference to the amount of drag experienced. The lowest drag clothing is both tight fitting and has a low 'surface drag' as the air flows over it. For time trialling, a tight fitting one-piece suit without pockets (or other features that could flap around in the wind) is hard to beat. Road riders should at least ensure they wear a snug fitting top. Exotic purpose-designed suits (eg Nike's Swift Spin suits) may offer the best performance of all, but they are expensive and rarely find their way onto the general market. Minimising drag requires a combination of correct rider position, riding tactics and equipment. The first two strategies are cheap – a simple drop in stem height or addition of aerobars can knock minutes off a 25-mile time trial. Going 'aero' with your bike and its components on the other hand could cost hundreds or even thousands of dollars! However, never loose sight of the fact that while reducing drag is a worthwhile goal, it shouldn't be at the expense of building a strong cycling engine. Remember, it's power you need to overcome drag! Sprinting – why short to long could be better than long to short! Most sprint athletes tend to use a 'long to short' training approach, where they perform slower aerobic and anaerobic work at the beginning of the training year and then progress to faster and faster anaerobic work as the season approaches and during the season itself. However, it doesn't have to be this way; some coaches believe that that this methodology is not only outdated but also that by turning convention on its head and using a 'short to long approach', better results can be achieved. The short to long approach emphasises speed through the year with athletes performing sprint training right from the beginning of the season. Proponents of this approach (such as Charlie Francis, the coach of ex-100m world record holder Ben Johnson) claim it can enhance speed development, allow for more 'speed peaks' through the season and reduce injuries that often occur when sprinters try to pick up the pace from their early season slow pace training. Because aerobic conditioning serves as a 'base conditioning' for health and fitness, it has formed the core of training programs for a number of different sports, including those where sprinting is the main type of activity. However, take a look at the actual volume of aerobic work performed by sprint athletes and sportsmen and you'll see it's very low indeed. Not only may time be spent training an energy system that will hardly be used, the slower pace of training can also serve to blunt the speed and power output in the fast twitch muscles that are required for sprinting. Short to long proponents like Charlie Francis recommend that experienced runners from 100-400m need only spend a short 6-week period at the start of the season performing training with an aerobic element, and even then, it shouldn't be long, slow runs but instead based on sets of short distance tempo runs of 100-300m performed at around 75% maximum speed. The short to long approach emphasises intensity throughout the year; a steady increase in training volume is not required or recommended – indeed volume may even decrease. This allows an athlete to remain close to his or her peak sprinting condition through the season, which in turn means that multiple peaks are possible through the season. The role of the coach is to try and successfully combine all the elements of perfect sprint performance (acceleration, absolute speed and speed endurance) seamlessly into these peaks, while simultaneously monitoring athletes to ensure adequate recovery is occurring and injury risk is minimised. The maintenance of power throughout the season is also important. Charlie Francis for example advocates that workouts to develop power such as maximum strength workouts in the gym should accompany all phases of the training. The exception to this however is during the maximum sprint-speed training phase, where the addition of maximum weight workouts could overload the athlete and produce burnout. He prefers instead to combine plyometrics and fast sprinting to produce maximal power. Intense sprints over 60-120m designed to improve the ability to maintain flat out speed. Reaching top speed is one thing. Being able to maintain top speed is another. Developing speed endurance enables an athlete to carry his or her speed for longer without fading and is therefore crucial – eg for a 200m athlete to maintain top speed down the home straight. The amount of speed-endurance training required will depend on the nature of the sport and the role in that sport. For example, a football midfielder needs more speed endurance than a goalkeeper who may have to occasionally sprint, but only for very short distances. A typical speed endurance workout for example might involve something like 5 sets of [sprint 20m, jog 20m, sprint 20m, walk 20m]. In the context of the short to long approach to sprinting however, the important thing to note is that speed-endurance training can and does blend seamlessly with the type of training an athlete will be performing anyway. For a full discussion and for detailed examples of speed-endurance workouts, readers are directed to George Dintiman's 'Sports Speed' (Dintimen G - Sports Speed, 3rd edition, Human Kinetics 2002), which provides an excellent treatment of this topic. The key to the short to long approach is that it continually emphasises the need to move at maximum speed and to this end it strips out any training approaches that could be detrimental to achieving this goal. It is also very carefully constructed to allow the athlete to optimally adapt and recover. Have you checked your Bike set up recently? ●● The compressive forces around and under the kneecap (patellofemoral) seem to be inversely related to saddle height (ie increased by lower saddle height and vice-versa) but the effects on other forces between the lower leg and thigh are uncertain. The researchers concluded that: "On the basis of the conflicting evidence on the effects of saddle height changes on performance and lower limb injury risk in cycling, the saddle height that best minimises the risk of knee injuries and increases cycling performance is one that results in a knee flexion angle of 25-30° when the leg is maximally extended" (ie at the bottom of the pedal stroke). Given that 50% of cyclists can expect to experience some knee joint pain as a result of overuse at sometime in their cycling career, this '25-30o' rule might be a good starting point when setting up saddle height for maximum performance and injury-free riding! The right shoe for the job - is your footwear causing injury? It doesn’t take a scientist, sports or other, to tell you that men and women are different. However, it was really only recently that kit manufacturers noticed this difference in the area of sports shoe design. A woman’s foot is 3-4% narrower than men’s - this is particularly manifest at the rear. Manufacturers need to create a specific ‘last’ for their shoes. A last determines the way the shoe is manufactured and the way the relevant pattern making machines are set up. Some sportswear brands such as adidas incorporate a soft and flexible insert in the shoe’s upper to reduce the friction that could lead to bunions developing. 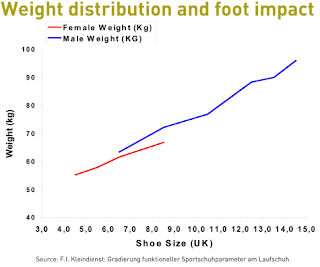 Women’s running shoes should be more flexible (but supportive and provide the ‘right’ control of foot-strike – see anthropometrical differences). Often their shoes will have a different tread configuration to allow the female foot to flex in its particular way. For example, in adidas shoes a thinner torsion ™ system bar and additional grooves in mid-foot add to the shoe’s woman-friendly flexibility. In the illustration below you will see two adidas shoes and their different sole configurations. 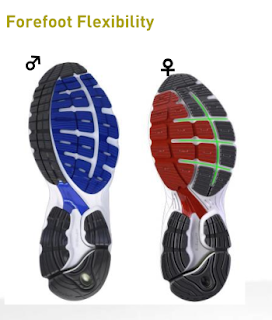 Notice the pattern (green) on the woman’s (right hand) shoe – this is designed to create greater flexibility. Because women do not generate as high impact forces as men on foot-strike they require less cushioning in their shoes. This can result in their running shoes having 21% less rear-foot cushioning and 24% forefoot cushioning. 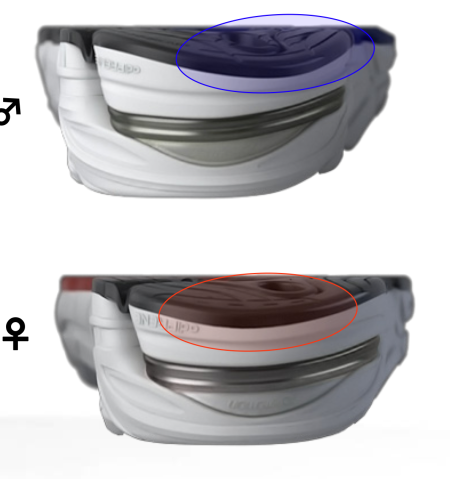 Women strike the ground with a much shallower angle (from heel to toe) compared to men and their feet tend to be less splayed compared to men. This is known as a ‘less exorated’ landing – putting it into everyday language women’s feet tend to strike the ground with their feet pointing forward at 12 o’clock, whilst men tend to strike the ground at a more ‘10 to 1 o’clock’ position. The different landing foot-strike angles require different heel bevel construction in running shoes. In a woman’s shoe it is more rotated to control their landing – see illustrations below. Women’s lower body shape creates greater and different forces on their knees and ankles compared to men. This is largely the result of their wider hips and the inward angle of their thigh bone (the femur which extends from the pelvis to the knee). This is known as the ‘Q angle’. The increased angular forces on the knee also create greater forces on it which could increase injury risk. As well as the Q angle other factors such as hamstring and quadriceps muscle flexibility, quadriceps strength, weekly mileage and weight can also influence whether a runner is more predisposed to injury. American researchers evaluated these (and other factors) in 20 runners (13 females and 7 males) ranging in age from 20–55. Specifically they were interested in the extent of the forces that the participant’s knees were subject to whilst running. It’s the often the case that the greater these forces the greater the risk of knee injury. The team discovered that the key factors in terms of increased knee forces were, not surprisingly, greater weekly mileage, poor hamstring flexibility, greater body weight and perhaps less obviously increased quadriceps strength. Greater quadriceps strength needs further explanation as this could be considered a positive and not a negative. In actual fact what matters in particular is the ratio of strength between the hamstrings and the quadriceps. Women tend to have weaker hamstrings when compared to men; this can ‘enhance’ the dominance of the quads in the running action – which due to their anthropomorphic considerations can increase the forces that their knees are subject to. It’s therefore recommended that women (and men) strengthen their hamstrings with relevant weights and body weight exercises (and improve these muscles’ flexibility). In doing so the forces to which the knee is subject can be reduced. Returning to the thoughts of the researchers, they believed that most of these risk factors could be altered to reduce injury potential. Med Sci Sports Exerc. 2008 Oct 8. Women tend to run with an over-pronated gait. Over-pronation means that the foot turns too much inward on foot-strike from the body’s centre line. This means that, depending on the degree of pronation, a shoe needs to be either a motion control or a support one. Pronation can lead to an increased injury risk. Shoes can be designed to reduce the forces that the knees are subject to – for example adidas shoes have a technology called ‘formotion™’ – which is positioned at the heel which control pronation and therefore knee loading. As can be seen from the above research and information, it is definitely not a case of ‘one size fits all’ when it comes to choosing the right running shoes based on your gender. There are myriad factors that that make the requirements of women’s shoes different to men’s and shoe companies are investing heavily in relevant technologies and research. Does Compression Clothing improve recovery - An interesting article! We all seem to be a little more clued up these days on the benefits of wearing the right clothing for our chosen sports to keep us cool, warm, dry, aerodynamic and most importantly comfortable and give us that extra edge. But did you know that what you wear could actually boost your recovery between workouts? How does compression clothing work to boost recovery? A good way to understand compression clothing is to consider flight socks, designed to prevent deep vein thrombosis. They cover the foot and lower leg, up to the knee, and provide graduated compression to stimulate circulation while the wearer is sedentary. This concept of boosting circulation is also crucial to the recovery function of compression clothing in sport. Complex knitting technology is used to manufacture a garment that applies graduated pressure on the body. This produces a massaging effect stimulating blood flow. With more blood flowing through muscles, the chemicals produced during exercise, such as lactate and lactic acid, can be removed from the bloodstream and recovery boosted in consequence. It’s the pooling of these body chemicals that can lead to muscle soreness and stiffness. We have probably all experienced Delayed Onset Muscle Soreness (DOMS), that tender ‘ouch to the touch’ sensation we get in our muscles after a very tough workout, or after doing an exercise for the first time, or after a long layoff. DOMS can last for up to 48 hours and, in severe cases, longer. During this period we will experience a reduction in muscle strength, reaction time, and spatial awareness (ie, we’ll be less coordinated). How do you benefit from compression clothing? By wearing a compression garment immediately after exercising, stiffness and soreness is reduced and the recovery process accelerated. This means that the athlete can resume intense training sooner. Compression garments also reduce muscle oscillation (which causes fatigue and damage), so easing muscle soreness post-exercise. You’ll probably have seen top athletes on TV, after training and matches, braving ice baths. These are designed to boost recovery and reduce training/match trauma. Other methods of recovery include ‘contrast bathing’ – where the athlete goes from warm to cold water conditions. The benefits of alternating hot and cold are an increase in blood flow to the working muscles, which then stimulates the removal of the chemical products of exercise, such as lactic acid. More specifically, contrast bathing stimulates the circulatory and nervous systems, by vasoconstriction (narrowing of blood vessels) and vasodilatation (widening of blood vessels). With increased heat, the temperature change will have four main effects - pain relief, muscle relaxation, blood vessel alterations, and beneficial relaxant effects on connective tissue (ligaments and tendons). Pain sensations are then inhibited by the cold application. This causes a constriction of small arteries and veins. The benefits include a decrease in the flow of blood and a reduction in swelling within the injured or over-exerted muscle tissues. The availability of contrast bathing facilities or ice baths is often limited at the everyday sports performer’s level. This is where compression clothing can be particularly beneficial, as it can be easily packed in your sports bag. And it can be worn while resting/sleeping to stimulate recovery. The fabrics include an anti-bacterial agent to keep clothes smelling fresh. Look to invest anything between £20 and £50 for a compression garment. Products include socks, short and long tights and short-sleeve and long-sleeve tops. The compression garments made by Skins™ have been scientifically shown to increase venous blood return by 31%. This increases oxygen delivery to the working muscles, helping the body to eliminate lactic acid and other metabolic products. IonX™ - Ionised Energy Fabric™ performance apparel and compression support delivers ionic energy to the body through a negatively charged electromagnetic field. Canterbury’s Ionised Baselayers and compression has been proven to increase power output by 2.7%. A negative ion is an atom that has gained electrons. This process is called ionisation. Negative ions provide us with a sense of wellbeing. An example of a natural ionisation process would be the atmosphere at a waterfall, where the water crashes downs and, as the water atoms hit the rocks, they gain electrons and become charged with negative ions. What does iIonisation do to aid the process of performance and recovery? The micro electrical field created by wearing an ionised garment next to the skin stimulates the body’s bioelectrical system, stimulating blood flow and increasing the transfer of oxygen to the muscle tissue. Ionisation helps to dilate the blood vessels, to improve blood flow. The more surface area you can cover, the better the recovery benefits - for example, a compression tight is better than a compression short. DO NOT overstretch the sock. The excess fabric will bunch behind the knee and cause discomfort. A detailed history, and examination by an appropriately qualified health professional, will allow a diagnosis to be made. An ultrasound or MRI scan can confirm the diagnosis. Other causes of symptoms in the area, such as those referred from the lumbar spine and local infection, should be excluded. Good flexibility of the calf muscles plays an essential role in the prevention of Achilles tendon injuries. It is also important to include balance and stability work as part of the training programme. This should include work for the deep-seated abdominal muscles and for the muscles that control the hip. This might at first appear odd, given the fact that the Achilles are a good distance from these areas, but developing strength and control in this area (core stability) can boost control at the knee and ankle joints. Training errors should be avoided. The volume, intensity and frequency of training should be monitored carefully, and gradually progressed, particularly when introducing new modes of training to the programme. Abrupt changes in training load are the primary cause of Achilles tendinopathy. I have found that, when track athletes (particularly sprinters), run over-distance repetitions (for example, 300m) as part of their training, the Achilles is subject to great forces, as the athlete tires and their heel drops further during each ground contact. This can be counteracted by purchasing a pair of middle-distance-type spike shoes that have a protective heel wedge. This reduces the strain on the tendon, as the shoe's heel offers greater protection, and is not subject to overstretching when fatigue is present. I also advocate that any running below 90% of maximum speed is performed in trainers and preferably on a stable grass surface. Very often sports people wait until their sports footwear (trainers/boots/spike) are well beyond the state at which they provide adequate protection and support before replacing them. Then, after an injury has occurred, they are advised by a physiotherapist and/or coach to buy a new pair. Trust me, it is cheaper to buy sports footwear regularly and stay healthy, than to pay for physiotherapy treatment (and buy the necessary footwear). This can relieve the symptoms of a painful swollen Achilles tendon. Using ice packs for a period of 20 minutes every two hours can help with the swelling and pain, but pain relieving medication may also be required. It may be necessary, in severe cases, to rest from high-impact activities for up to three months. This is because the collagen tissue, which the body produces to repair the damaged Achilles tendon tissue, can take three months to lay down. Non-impact training, such as pool work, can maintain fitness during this period, and other body parts can be exercised with weights or other exercises. A physiotherapist may gently mobilise the soft tissue by providing controlled stress to help the tendon adapt and gain tensile strength. Published research has suggested that recovery is promoted by using a very gradually progressed strengthening programme for the Achilles tendon and calf muscles under the supervision of a sports specialist/therapist/Physiotherapist. This strengthening programme uses eccentric muscle work, which means that the muscle is lengthening while contracting. Maximum tension is generated in the muscle and tendon during eccentric contractions. It is important that an appropriately qualified therapist looks at the players'/athletes' overall body alignment to detect if the injury has been caused by a biomechanical problem. Over pronation can place excessive strain on the Achilles and lead to Achilles tendinopathy. An orthotic insert may be required but, in many cases, biomechanical problems are caused by stiffness in the joints. The therapist can mobilise them, which, if normal range of movement is attained and maintained, can often eradicate the problem. The Achilles tendon is situated above the heel and forms the lower part of the calf muscles. It is a continuation of the two calf muscles, the gastrocnemius and soleus muscles, and it attaches to the heel bone. It is the strongest tendon in the human body and must withstand great forces. Its function is to transmit the force produced by the calf muscles to lift the heel and produce the push off during walking, running and jumping. The Achilles can produce force of up to seven times body weight. This shows just how much force it has to withstand during sporting activities, such as sprinting, jumping and turning. Achilles tendinopathy is a common sports injury. It's caused most frequently by overuse. You might be more familiar with the term 'Achilles tendonitis'. However, in the absence of inflammation, tendinopathy is the more appropriate term. Until medical examination determines if there is Achilles degeneration (tendonosis) or inflammation (tendonitis) the condition is referred to as tendinopathy. Achilles tendinopathy is characterised by degeneration (tendonosis) of the tendon, often without an inflammatory response. The degeneration means that the tendon does not have the usual tensile strength and may be liable to rupture during continued sporting activity. However, before you get alarmed, this is very unlikely. · Achilles pain, which increases with specific activity, with local tenderness to touch. · A sensation that the tendon is grating or cracking when moved. · Swelling, heat or redness around the area. · The affected tendon area may appear thicker in comparison to the unaffected side. · There may be weakness when trying to push up on to the toes. · The tendon can feel very stiff first thing in the morning (care should be taken when getting out of bed and when making the first few steps around the house). · A distinct gap in the line of the tendon (partial tear). Inflammation/strain of the tendon is usually caused by overuse – for example, frequent jumping in volleyball, netball or basketball. It is often also caused by a sudden increase in certain types of training, such as hill sprinting or track running, particularly when running in spikes. Tendinopathy can also be associated with ageing. Our ability to regenerate damaged tissue decreases as we age and the quality of the tendon deteriorates. However, the better news is that sensible training can actually strengthen all our soft tissue (tendons, ligaments and muscle). Tightness in the calf muscles will demand greater flexibility of the tendon, which inevitably results in overuse and injury. Biomechanically, the tightness can reduce the range of dorsiflexion (toe up position) in the ankle, which increases the amount and duration of pronation. This problem is known as overpronation. * This reduces the ability of the foot to become a rigid lever at push off and places more lateral and linear forces through the tendon. This imbalance can translate into altered rotation of the tibia (shin bone) at the knee joint and, in turn, produce compensatory rotation at the hip joint with subsequent injuries to the shin, knee and hip. Lack of stability around the ankle joint can also be a contributory factor, as recurrent ankle sprains appear to be associated with a high incidence of Achilles tendonopathy. Wearing shoes that don't fit or support the foot properly can be a major contributing cause of Achilles tendon injury. Delicious & easy lunch or dinner option, try it! 2. For the frittata, heat the olive oil in an ovenproof frying pan and gently fry the onion for 2-3 minutes, or until softened. Add the spinach, cherry tomatoes and sweet potato and continue to fry for a further 3-4 minutes or until the sweet potato is just becoming tender. 3. Pour in the eggs, season well with salt and freshly ground black pepper and cook for 1-2 minutes, or until the egg starts to set around the edges. Transfer to the oven for 2-3 minutes, or until the egg is just set. Remove from the oven, slide onto a serving plate and cut into wedges. Keep warm. 4. For the salsa verde, place all of the salsa verde ingredients into a food processor and blend until smooth. 5. To serve, drizzle the salsa verde around the edges of the plate.